Having written and directed three Pink Panther movies in a row, Blake Edwards longed to produce a film that was more sophisticated, hip, and adult. The resulting picture, 10, proved not only to be a box office smash; it also introduced the world to Bo Derek (a dubious distinction) and cemented the stardom of Dudley Moore (sans comedy partner Peter Cook). Moore stars as George Webber, a songwriter who feels “betrayed” by age and dissatisfied with life, despite wealth, success, supportive friends, and a long-time relationship with a theater star (Julie Andrews). While stopped at a traffic light, George happens to catch a fleeting glimpse of a beautiful bride (Bo Derek) in another car, and his general malaise blossoms into a full-on midlife crisis. He becomes obsessed with the girl, but being that 10 is a comedy, George’s attempts at stalking generally degenerate into drunken slapstick. Eventually, bolstered by pain pills and liquid courage, George decides to travel to Mexico to interrupt the girl’s honeymoon. That’s not to say I didn’t enjoy the film. Few actors are as likeable as Dudley Moore, and the film gives him numerous opportunities to show off his musical and comedy chops. 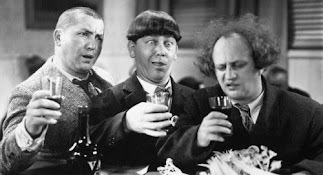 It helps that his character is intoxicated much of the time, because Moore’s slurred slapstick is inspired (his double-glass approach to drinking while on pain pills is particularly memorable). The rest of the cast is capable, and a young Brian Dennehy is a standout as an extremely supportive bartender. Edwards’ film, while no classic, is diverting and well-made. Today it works best as a time capsule of the late 70’s--a far-off world of 8-tracks, short shorts, wet bars, psychoanalysis, and orgies. I’ll drink to that. Potent Quotables--COP: You better take it easy. Pain pills and alcohol don’t mix. GEORGE: You could have fooled me. Similarly Sauced Cinema--Dudley Moore went on to soused cinema immortality with Arthur (1981). 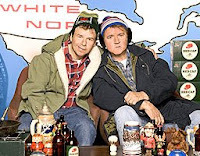 Back on April 28th, I wrote that Dave Thomas and Rick Moranis would be returning to the small screen for an animated Bob and Doug MacKenzie series. However, at that time, no U.S. network had agreed to air the show. 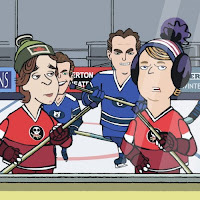 Since then, it has been announced in the Hollywood Reporter that Fox is picking up The Animated Adventures of Bob & Doug McKenzie for some unspecified date in 2009. Thirteen episodes have been ordered. Sleepless in Seattle?! Really?! You're kiddin' me; right?! On the whole, I thought the "Top 10" selections skewed a little too much toward recent fare. That's to be expected, I guess. The members of the American Film Institute are getting younger, and many classics are not as well remembered as they once were. That said, the Romantic Comedy "Top 10" really irked me. Sleepless in Seattle?! Not a single film by romantic comedy masters Ernst Lubitsch, Leo McCarey, Howard Hawks, Preston Sturges, or Billy Wilder ranked in the "Top 10." Do you really expect me to believe that Sleepless in Seattle is a more essential and iconic romantic comedy than His Girl Friday, Bringing Up Baby, My Man Godfrey, The Awful Truth, Ninotchka, Sullivan's Travels, or Some Like It Hot? Oy! I realize that any "Top 10" list is bound to encourage debate and voting for such things is more or less a popularity contest. But Sleepless in Seattle?! Geez! Have a little taste. You can find all of the "Top 10" selections on the AFI's site. To end on a positive note, the inclusion of Cat Ballou and City Lights were welcome surprises. MGM tried its hand at Warner Brothers-style gangster action with Public Hero #1; and while not on the level of the Cagney/Bogart classics, the resulting film is a fast, diverting crime flick. Chester “Boston Blackie” Morris stars as Jeff Crane, an undercover federal agent, who is placed in prison to befriend and bust out mobster Sonny Black (Joseph Calleia). The feds hope that Black will lead Crane to the rest of his gang, but the plan hits a hitch when the mobster is wounded in the jailbreak. In order to keep the gangster alive long enough to lead the feds to his hideout, Crane tracks down an alcoholic mob doctor (Lionel Barrymore), but traversing flooded roads and keeping the soused sawbones sober may be too large a job for any one man. To complicate matters further, Crane falls for a smart-talking cutie (Jean Arthur) that he meets while trying to transport the drunken doctor. Of course, she turns out to be the gangster’s sister. Public Hero #1 is not the type of film that any actor would put towards the top of his or her résumé. It starts as a hardboiled prison drama, turns into an undercover FBI thriller, flirts with romantic comedy and booze humor at its center, before touching down for a rat-a-tat action climax. In other words, the movie is a total mess. Still, it works, due almost entirely to its above-average cast. Chester Morris, a grade-“A” over-actor, does a good job keeping things moving during the film’s few slow patches; but it is really the work of Arthur and Barrymore that elevate the movie above “B” status. Jean Arthur brings a screwball breeziness to her line readings that enliven every bit of dialogue she’s given. Best of all, Lionel Barrymore has a ball staggering, slurring, and hamming his way through every scene. In no way is Public Hero #1 an essential “Booze Movie,” but soused cinema enthusiasts will find plenty to like in Barrymore’s Dr. Josiah Glass and the schizophrenic little gangster flick that he inhabits. Potent Quotables--DOC GLASS: I’m on a case. MARIA: And two bottles to go. DRUNK: Better wait until it stops raining. The bridge is under three feet of water. 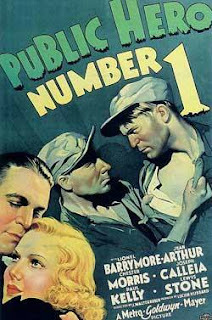 Similarly Sauced Cinema--Director Rubin produced a near-identical remake of Public Hero #1 in 1941. The new version, The Get-Away, starred Robert Sterling as the hero, Donna Reed as the girl, and Charles Winninger as the alky doctor. Blazing Saddles has been called the greatest Western comedy ever made. It is certainly that, but it is much, much more. It’s stiletto-sharp satire of racial prejudice. It’s a boundary-busting celebration of vulgarity. It’s nearly a Warner Brothers’ cartoon. It’s almost a musical. And, like most Westerns, it also happens to be a booze movie. First and foremost, it’s a parody--a film about jokes rather than plot. However, the story, what there is of one, is as follows. It’s 1874 in an unnamed Western state, and the Attorney General, Hedley Lamarr (Harvey Korman), hatches a scheme to make a quick profit by buying up land when he discovers that the railroad must divert through the backwater town of Rock Ridge. He sends a band of cutthroats to run off the residents; but rather than pulling up stakes, the citizens wire the governor (Mel Brooks) to send them a new sheriff. 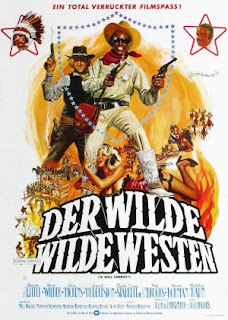 Undaunted, Lamarr convinces the governor to appoint Bart (Cleavon Little), a black railroad worker, to the post, certain that the citizenry will never accept the new sheriff due to the color of his skin. Can Bart defeat frontier racism and the nefarious schemes of Hedley Lamarr? With the help of alky gunfighter, the Waco Kid (Gene Wilder) and a lot of ingenuity, Bart manages to save the day. Blazing Saddles is an exceptionally funny film--so funny that it garners a guffaw before the first word is spoken (thanks to the exaggerated whip crack that precedes the lyrics of the opening theme). The writers take aim at every Western cliché, including the whiskey-sodden gunfighter (in the form of Gene Wilder’s shaky-handed Waco Kid), and few comedies have a better hit to miss ratio. Many of the pop culture jokes, such as references to Olsen and Johnson, Laurel and Hardy, Randolph Scott, and Douglas Fairbanks will likely to go over the heads of younger viewers, as will the comically exaggerated imitations of Gabby Hayes and Marlene Dietrich. However, silliness is eternal, and Mel Brooks’ inspired lunacy will stand the test of time. The movie will also endure because it is one of the smartest films ever produced on the subject of racism. Like Dr. Strangelove (1964), Blazing Saddles ridicules its dark subject with subversive humor and is a more effective statement for the use of the jokes. It isn’t an easy to create an entertainment that is sophisticated and juvenile simultaneously, but Brooks and his sparkling cast make it look easy. The cast is, of course, top notch; and Korman, Kahn, Little, and Pickins give career-topping performances. Like good whiskey, this comic gem has just improved over time. Potent Quotables--BART (regarding the Waco Kid’s boozing): A man drink like that and he don’t eat, he is going to die. Video Availability--Blazing Saddles is available on DVD (Warner Brothers) as a standalone disc or as part of The Mel Brooks Collection (Fox). An ultra-sharp Blazing Saddles [Blu-ray] is also available. Similarly Sauced Cinema--For more alky gun slinging, check out Lee Marvin as Kid Shelleen in Cat Ballou (1965).